For more than a decade, the latest Apple products have been the annual must-have holiday gift for the tech-savvy. That raises the question: Is the newest Apple Watch on your list—either to give or receive—this year? At first glance, the watch appears to be an ideal present for Apple's most familiar market: the hip early adopters. Its promotional website is full of svelte young people stretching into yoga poses, kickboxing and playing basketball. But when Apple introduced its latest model in September—the Series 4, which starts at $399—it was clear that it was expanding its target audience. This Apple Watch includes new features designed to detect falls and heart problems. With descriptions like "part guardian, part guru" and "designed to improve your health ... and powerful enough to protect it," Apple signaled its move toward preventive health and a much wider demographic. "The health care market is obviously important to Apple," Andy Hargreaves, an Apple analyst with KeyBanc Capital Markets, wrote in an email. The fall prevention and electrocardiogram apps are a "play to sell people more stuff" and bring health-monitoring apps beyond just "fitness people" to baby boomers who want to keep themselves and their parents healthy, he said. This watch could be a perfect present for those older people, said Laura Martin, a senior analyst with Needham. "People who wore watches their whole lives, plus fall monitoring?" Martin said. "Voila! It creates another on-ramp for another consumer in the Apple ecosystem." The fall-monitoring app uses sensors in the watchband, which are enabled for people 65 and older after they input their ages. These sensors track and record the user's movements, and note if the wearer's gait becomes unsteady. If a fall is detected, the watch sends its wearer a notification. If the wearer doesn't respond within a minute by tapping a button on the watch to deactivate this signal, emergency services will be alerted that the wearer needs help. Many geriatricians and medical experts agree that this app could help older people. 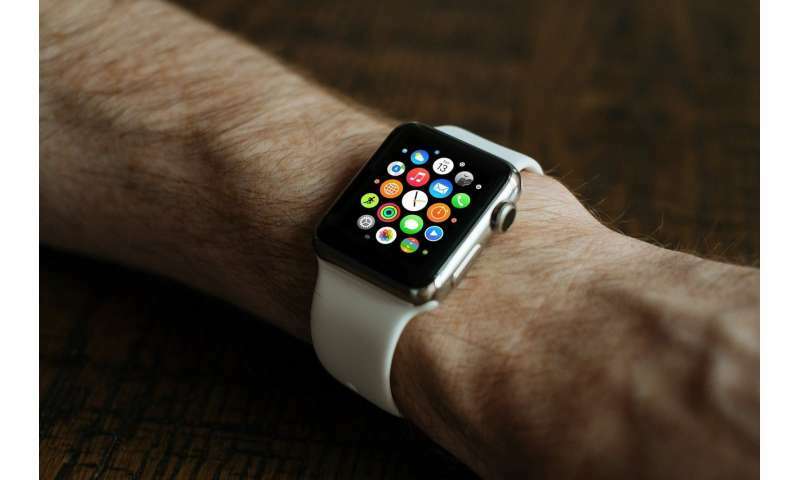 Dr. Armin Shahrokni, an internist with Memorial Sloan Kettering Cancer Center who describes himself as "tech-savvy," is excited that older patients might get into wearable technology. "In older cancer patients, my area of expertise, all the chemo can make them fall more," he said, making detecting falls and balance important. The other app, the ECG monitoring app, uses sensors in the wristband to monitor a patient's heartbeat and send alerts if it gets too fast or too slow. Specifically, the app is meant to detect atrial fibrillation, which is a type of arrhythmia, also described as a problem with the speed or rhythm of the heartbeat. The watch's sensors can detect a heart rhythm in 30 seconds, creating a "waveform" readout. It also allows the user to note how they are feeling—lightheaded, winded, full of energy—at that moment. This combination will help people have better conversations with their doctors about symptoms and heart patterns, according to Apple. The Food and Drug Administration cleared this function for people 22 or older. However, it's rare for anyone younger than 50 to be diagnosed with atrial fibrillation, said Eric Topol, a cardiologist at the Scripps Research Institute. "It's mass use of a tool, and with that is going to come lots of unintended consequences," Topol said. "It'll lead to a lot of anxiety and expense and additional testing, and even then some people will get blood thinners inappropriately. "This is the opposite of individualized medicine, where you are using something on exactly, precisely the right person." Consumers can expect more ways to track vital signs, like blood sugar, and more apps that will use those numbers to help people prevent medical emergencies, said Ross Muken, an analyst with Evercore ISI. While health tracking isn't a new concept, putting that data into an algorithm to help change behavior and get ahead of a health crisis is the next big frontier for wearable health technology products. Experts caution, though, that while the FDA "cleared" these new apps, it hasn't "approved" them, which is a bureaucratic distinction that means they haven't faced as much rigorous testing as something that has the agency's approval. For example, there are no findings from studies or trials that offer evidence of the fall prevention or ECG apps' benefits, Topol said. "We don't have any data to review. These are unknowns." Someday, he said, he expects the "medicalized smartphone" to be more common, cheaper and accessible. Right now we're seeing the very beginning of this technology be put into use. "Technology is way ahead of medical practice," Topol said.